At StoreMoreStore we’re not just about office storage products anymore. 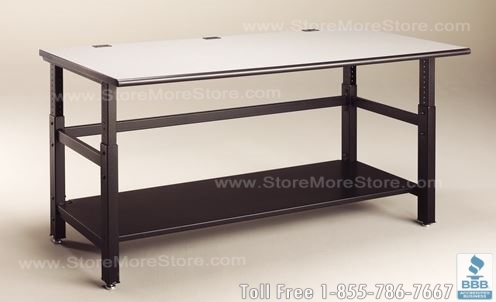 We now have a full line of automotive storage products including adjustable workbenches and heavy duty cabinets. Our automotive storage products will help you get your work done safely and efficiently. 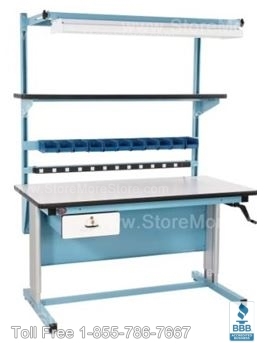 Whatever your dealership or repair shop needs, we have all sizes and styles of adjustable workbenches and heavy duty cabinets that will meet your specific automotive storage requirements. A workbench that is the wrong height can cause serious back pain and even injury over time. But building a workbench for every employee is impossible because the cost of that alone would bankrupt your business. That’s why an adjustable workbench is a great solution. Multiple employees can use it, and they can all change the height to meet their specific ergonomic needs. Our heavy duty cabinets with drawers are designed to stand up to intensive daily use. We also call them heavy duty for a reason; each drawer can hold up to 400 pounds! The heavy duty cabinets are available in 5 different widths that are each offered in different depths, which makes a total of 11 combinations that are all offered in 6 different heights. Add to that the 10 drawer heights you can chose from and you have an incredible amount of possibilities. You are guaranteed to find the right size for your automotive storage needs. 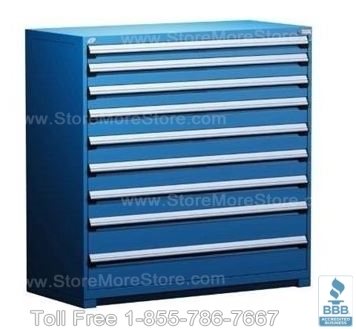 Shop online now at StoreMoreStore for our automotive storage products including adjustable workbenches and heavy duty cabinets! If you need any help or have any questions about our automotive storage products, please feel free to give us a call at 1-855-786-7667.